Although advanced SEO strategies like generating link popularity and domain authority might be beyond the reach of most marketers, below are five ways these parties can jump start a surgeon SEO strategy. Creating directory listings on major sites like Yelp, Yahoo! Local, Bing, Yellow Pages, etc. is a great way to embark on SEO. But what exactly do these listing do help support SEO for surgeons? 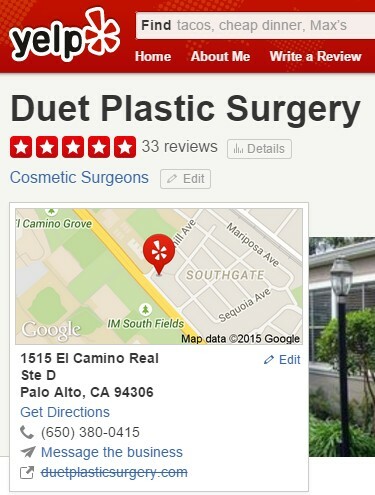 Here’s an example of great listings for plastic surgeon in Palo Alto, CA. Having several 5-star reviews also helps increase the value of these listings. First take a look at the Google local search engine results for a keyword search like “plastic surgeons San Francisco”. You’ll most likely see a special set of local listings that are associated with Google Maps. Citations are a mechanism that Google uses to assess the credibility of a local entity. So the more accurate citations a business can build throughout the web (typically via local directories), the better chances Google will position the business higher in the Google local search listings. This why so many Google local SEO services are focal to citations and NAP auditing. Accuracy is vital, as any inconsistency in NAP will raise a flag to Google. Be sure to have the exact content down as you go out and build directory listings. A great resource to help you get started is Andrew Shotland’s The Best Online Local Business Directories for SEO. Here you’ll get a bit more insight as to how citations, directories, and local SEO are all related, as well as where you should start your efforts. While getting listed on conventional local directories is an easy way to get started doing SEO for surgeons, you can take this practice one step further by finding opportunities to get listed on directories related to surgery and medical topics. Because these types of directories are closely aligned with surgery, Google will attribute greater value to these citations (as well as the backlinks) stemming from each listing. For instance, if you’re a plastic surgeon in a competitive area like San Francisco, a listing from the American Society of Plastic Surgeons could be well worth any membership fees. In addition to the local SEO value derived from the citations and backlinks that these directories offer, often times these listings can generate direct traffic to a surgeon website. For example, another authoritative directory-esque website, RealSelf.com, usually ranks pretty high for surgery related keyword searches in Google. Visitors might find your listing on this website and later follow the link from RealSelf.com to your practice site. You may or may not be aware that social media is playing a more crucial role in SEO and influencing search engine rankings. While there’s great debate around this topic, there’s no doubt that brands (whether local or enterprise-level) that have strong social authority across numerous platforms (i.e. Facebook, Twitter, Google+, etc.) also have greater visibility in Google search. Google has yet to confirm that social media has a direct impact on search engine rankings, however there’s a lot of compelling data that supports this possible correlation. One of the most interesting topics surrounds social signals (that is, the Likes, Tweets, +1’s, Shares, Pins, etc.) that are attributed to well-liked content. And while other rank signals like backlinks continue to be abused by the black-hat SEO community, social signals prove to be sound, legitimate way to define credible content that’s worthy of higher rankings. So how does a surgeon and his/her team co-mingle SEO and social media marketing? A good place to start is to get established on a few of the most prominent networks available. Once established, the next important step is to reach out and connect with related and complementary pages and profiles. By engaging with others and sharing quality content, you can slowly cultivate a respectable social media presence that can directly influence your SEO potential. Equally as important (and perhaps equally as time consuming) as social media marketing, is producing content. Whether in the form of videos, patient testimonials or before and afters, educational blog posts, or infographics, content brings a wealth of value to your overall SEO and Internet marketing strategy. SEO – Keeping your site fresh with new content (particularly keyword relevant content) will only help your sites SEO potential. From a search engine perspective, fresh content signifies a site that’s worthy of frequent crawling and indexing, which is great for ongoing SEO. Social Media – Having internally-generated evergreen content gives you something great to share with your social media audience. 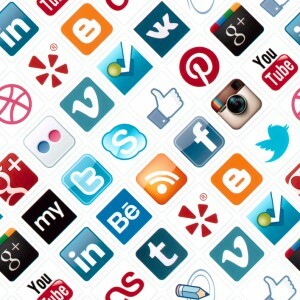 Such content serves as a vital asset to inbound traffic to your site from social platforms. Branding – Define your surgery practice as an authority by producing valuable content that resonates with your target audience. When patients have questions, you can refer them to specific articles throughout your site. Take your digital marketing efforts offline by networking with other related medical professionals. 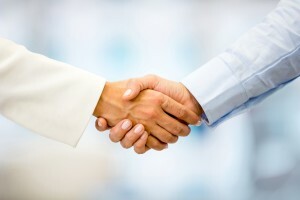 Often times building relationships with other surgeons and medical specialists opens the door to many possible opportunities. When it comes to SEO, surgeons can cultivate reciprocal relationships that can benefit both parties. A few examples of the SEO-opportunities that can spawn from off-line relations include: guest blogging, link exchanges, content sharing, and growing your social media audience.